KUALA LUMPUR: "Daulat Tuanku (Long Live the King)!" Sultan Muhammad V was installed as the 15th Yang di-Pertuan Agong at Istana Negara here today, for the next five years. The installation ceremony, steeped in Royal Malay customs, marked the formal commencement of his tenure as the Supreme Head of the Federation which also reflects the stature of Constitutional Monarchy practised in the country. 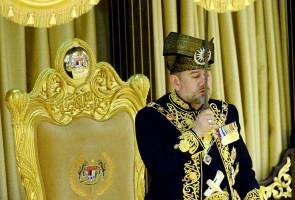 Sultan Muhammad V, 47, had previously taken his oath of office on Dec 13 last year. He ascended to the the throne succeeding Sultan Abdul Halim Mu'adzam Shah of Kedah, whose term ended on Dec 12. Malaysia is one of 43 countries in the world that practice constitutional monarchy, with the rotation system in selecting a King, being the only one of its kind in the world. Some 800 guests witnessed the colourful and glorious ceremony, including the Malay rulers and their consorts; the representatives of the Malay rulers; the Yang Di-Pertuas Negeri; the Prime Minister Datuk Seri Najib Tun Razak and wife, Datin Seri Rosmah Mansor; and Deputy Prime Minister Datuk Seri Ahmad Zahid Hamidi and wife, Datin Seri Hamidah Khamis. Also present were Cabinet ministers, heads of government departments and foreign diplomats. The sound of trumpets and the beating of drums by the Gendang Besar D'Raja Kelantan band reverberated in the Balairong Seri (Throne Hall) of the national palace to the tune of "Raja Bertabal" as soon as Sultan Muhammad V took his Oath of Installation. This was followed by three shouts of "Daulat Tuanku" led by the Datuk Paduka Maharaja Lela (Grand Chamberlain) Major Gen (Rtd) Datuk Mamat Ariffin Abdullah. This was then followed by the firing of a 21-gun salute and the playing of the national anthem "Negaraku" by the Royal Malaysian Air Force band. The installation ceremony was telecast live by Radio Television Malaysia (RTM). Earlier, the ceremony started with Sultan Muhammad V making an entrance to the Balairong Seri, to the accompaniment of the blowing of the trumpets and the beating of drums by the band, playing the tune "Raja Berangkat". It was preceded by the entrance of Datuk Pengelola Bijaya Diraja Datuk Wan Ahmad Dahlan Ab Aziz who led the royal arrival procession, which also comprised the Bearers of the Royal Regalia and Maces - the "Cogan Alam" (Mace of the Universe) and the "Cogan Agama" (Mace of Religion). Both maces, which are made of silver, are part of the royal regalia and are also the Malaysian Government''s national insignia. Sultan Muhammad V was attired in the official dress of the Yang di-Pertuan Agong, called the Muskat, which is made of black wool and embroidered with gold threads, as well as the "Dendam Tak Sudah" headgear or "tengkolok", and embroidered long pants. His Majesty also donned the Royal Buckle or the "Pending Diraja" which is made of gold and decorated with rubies, with an engraved centrepiece featuring the Federation Crest, while the belt is made of heavy ribbed silk and embroidered with floral motifs in gold thread. Pinned at the waist of His Majesty was the "Keris Pendek Diraja" which was forged from the blades of antique keris. The hilt and sheath are made of ivory embedded with gold. Sultan Muhammad V was then ushered to his throne, marking the start of the installation proceedings. The Grand Chamberlain then sought consent from His Majesty to begin the ceremony and made the announcement. Subsequently, the Grand Chamberlain also sought His Majesty''s consent to bring in a copy of the Al-Quran and the remaining royal regalia for the ceremony. This was followed by the entrance of the second group of bearers and Al-Quran entrustment, with Datuk Pengelola Bijaya Diraja bearing a copy of the Al-Quran, while other Istana Negara officials brought in the "Keris Panjang Diraja", the Proclamation of Enthronement and Installation, and the Oath of Installation. They were accompanied by the blowing of trumpets, playing the tune "Seri Istana". The Al-Quran, the symbol of the sanctity of Islam as the official religion, was then presented to His Majesty by the Grand Chamberlain. His Majesty then kissed it and placed it on a "rehal" or Quran stand on a table placed on his right side. The Grand Chamberlain then presented the Proclamation of Enthronement and Installation to the prime minister who later proclaimed the enthronement of the Yang di-Pertuan Agong. This was followed by the presentation of the "Keris Panjang Diraja" or the Keris of the Government by the Grand Chamberlain to His Majesty, who drew the sabre, kissed it, and returned it to its scabbard before placing it on a table to the left. His Majesty then took his Oath of Installation, pledging among other things to perform his duties in accordance with the laws and constitution, and to protect Islam at all times. This was followed by the blowing of the trumpets, the beating of the drums, and the three shouts of "Daulat Tuanku" led by the Grand Chamberlain and others in the Balairong Seri. Moments later, a 21-gun salute was fired, followed by the playing of the national anthem "Negaraku". The prime minister, representing the government and the people, congratulated His Majesty and pledged loyalty to the newly installed Yang di-Pertuan Agong. His Majesty then delivered his Royal Address before the recital of prayers by Istana Negara religious officer Datuk Abd Aziz Che Yacob. The Grand Chamberlain then took down the Al-Quran from the throne before announcing that the ceremonial proceedings had successfully been concluded. Following the conclusion of the ceremony, the Yang di-Pertuan Agong left the Balairong Seri to the accompaniment of the blowing of trumpets and beating of the drums, playing the tune "Raja Berangkat". Sultan Muhammad V was elected the 15th Yang di-Pertuan Agong at the 243rd (Special) Meeting of the Conference of Rulers at Istana Negara on Oct 14 last year.